You will earn 4,515 Reward Points. Earn 1 reward point for every 1 dollar spent. 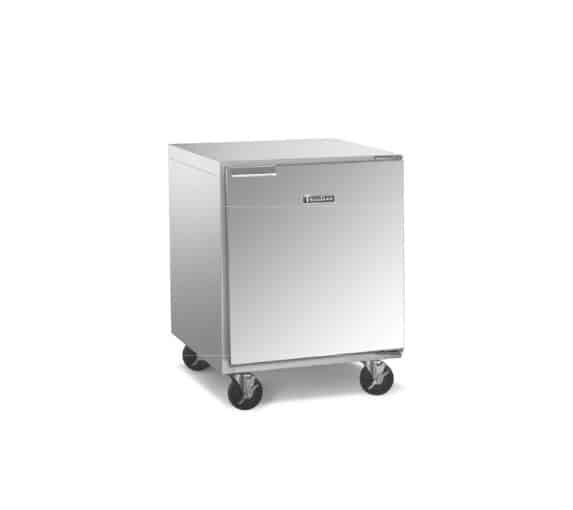 Traulsen's durable, high performance, compact undercounter refrigerator models provide a high quality/high value alternative to the all too common commodity types in today's market. Durable, built with stainless steel exteriors and anodized aluminum interiors, their heavy duty cabinet construction promises years of useful service. Truly front breathing, their design allows for "zero-clearance" installation. As a result they can be placed right up against the back wall and alongside other kitchen equipment, saving valuable floor space. Additionally, they offer a wide range of optional accessories to choose from, and are ideal for use with many different type applications. *Optional accessory kits shipped separately for field installation. Cabinet exterior front, one piece sides, and doors are constructed of 22 gauge stainless steel. Cabinet interior and door liners are constructed of anodized aluminum. The exterior cabinet back and bottom are constructed of galvanized steel. Door self close at less than 90 degrees and also include a stay open feature at 105 degrees. Gasket profile and Santoprene® material simplify cleaning and increase overall gasket life. Both the cabinet and door(s) are insulated with an average of 2" thick high density, non-CFC, foamed in place polyurethane. A balanced, rear mounted, front breathing, self-contained refrigeration system using R-134a refrigerant is provided. It features a capillary tube metering device, air-cooled hermetic compressor, a forced air evaporator coil and a non-electric condensate evaporator. An 8' cord and plug is provided. Standard operating temperature for refrigerator models is 34 to 380 F.